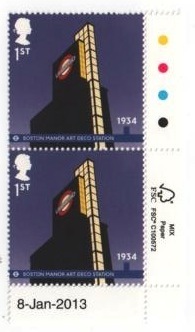 Collectors will have noticed that the London Underground sheet stamps show a sale date of 8 January, and the presentation pack is also dated 8 January. Royal Mail have now confirmed that the scheduled issue date (a Tuesday) was changed "to mirror the date the London Underground determined to use as their official anniversary". Fortunately although this was done after printing it was before the date of issue was announced to dealers and collectors.